Letter well written by a Malaysian Chinese working abroad now. On my way to London yesterday, I finished 3/4 of the book on the Maverick, my conclusion long before reading this book was; all of us , Malaysians ( my ancestors came from China to Malaysia more than 150 yrs ago) have been divided (or screwed) by all these greedy and heartless politicians, whether they are from UMNO, MCA, Gerakan or MIC, and they are all the same. The wealth in the country should be shared by all of us, but UMNO started NEP, AP, MARA, etc etc to split us in the name of wealth distribution. But after 40 years since May 13 1969, what have we achieved? The govt still think that all the targets set under NEP have not been achieved? How could these be possible if at least 30% of PLC shares must be allocated to bumiputras, Non-bumis not allowed to get APs, open new petrol stations, scholarships, all govt contracts must have Bumis equity, certain sectors of the businesses were not opened to non- bumis until the recent years but still tightly controlled, and Bumi controlled companies so as GLCs don’t have to hire non-bumis. So how could the nation be united, progress or the lastest favour of the day, 1Malaysia be successful if meritorcracy is not relevant in practice? And each day we become more suspicious of each other’s co-existence. When I decided to move my family abroad and take up the CEO job managing a small MNC with revenue of USD2b and 20k employees in 4 countries, my UMNO and MCA friends said to me; how could you abandon your country and work in Spore? I told them to find me a GLC position and I don’t mind a loss making one for me to turnaround.. A couple of them told me, they would look into it. More than 5 yrs had since passed, I received no reply, except every time when I met them, they would say, when are you coming back? Pete and Jalil know me very well. For the rest to know, I am now managing China’s second largest fridge and freezer maker with more 3m units sales a year, China’s largest diesel engine producer with closed to 500K diesel engines sold this year, plus the largest building materials supplier in Spore. Under me, one co is listed in NY, one in KLSE and three in Spore. Am I not qualified to manage a GLC? Don’t get me wrong that I need a job, but to move abroad after 46 years, was quite a painful experience! I would love to return to my home land, share my experiences and contribute my knowledge to the development of the country. But with all these greedy politicians (P) fighting for positions (P), leading them to power (P) and finally the big P – PROFIT; why should they place the rakyat’s interests above theirs? Look at the mess in MCA, and the 6 Indian parties fighting to exist, and investment for a seat in the UMNO supreme council. It is all about the big P, not the Malaysians. How many of the current ministers are qualified or fit to manage a ministry? Managing a ministry is very similar to managing a business which involves in managing various resources, especially the huge financial resources allocated to the ministry for the benefits ( security and safety, environment, less toll, education) of the people who paid taxes ( in business is ROSF or dividend paid to the investors), for the poor to improve their livings, for national development on infrastructure to create future values hence sustainability. But hardly any of them has any clue on what Human Resources or Financial Management are all about. They are too occupied with cutting ribbons, party meetings, overseas trips, identify contracts for pockets (the big P). All these started with the Maverick’s 22 years in power. 1n 1986 I started with a salary of RM2400 working in a bank, bought a Nissan Sunny for 13k, and 4 years later bought a double storey terrace house in PJ for 120k. I sold the house in 1997 for 350k ( now probably worth 450k), and a 1300cc car easily costs 30K or more now, but today new graduates still get their starting pay of RM2000. What went wrong in our country? As a Malaysian of Chinese origin, let me share with our fellow Malaysians : We are no threat to this country, economically or politically. We are the minorities, we don’t inspire to govern the country, even if the opposition wins the next election, the Prime Minister will still be a Malay. MCA is not relevant to us anymore. What have they done to protect us? So don’t listen to all the Politicians especially the maverick, that the Chinese are trying to grab power. Is this possible? We want a fair govt to treat us as Malaysians, and play no racial politics to divide all of US. Look at the Airports and certain government buidlings, we have signages in Arabic and Japanese, but not in Chinese or Tamil. If you look at Renminbi (Chinese currency), there are 6 different languages printed on the notes to represent the 6 major races in China, although the Hans ( most the Malaysians Chinese are Han origins) easily constitute 90pc of Chinese population. Minorities are not respected in our homeland. In China, the one child policy is mandatory for the Hans, not the other minorities. After 52 long years, it is time we give another political party a chance to govern. If we don’t change, there is Malaysia, but there will be no Malaysians! For our Children, our future, think about it. Dump those BN parties… that’s all I can say. For the sake of all Malaysian, for good or for worse, we need to have a new set of ruling government. That is what had happened in Taiwan, Japan and Philippines. WE HAVE BEEN FOOLED FOR OVER 50 YEARS BY THE BN. KEEP THEM THERE, AND WE ARE JUST FILLING UP THEIR XXXXXXL SIZE POCKETS. Yeaa—the taxpayers money…thank you very much– and all of them studying Islamic Studies. Do I see any Chinese? This is a funny blog and I salute him. I hope ISA does not shutdown his site. First, I would like to congratulate the PM Najib and the government and everyone else (MAS, AirAsia, etc) for speedily getting over 10,000 Malaysians (mostly students) out of the violence-riddled Egypt. The PM did the right and did it well. It is not easy to get so many people out of a riot-hit country so far away – hence this is definitely a remarkable logistical feat. Well done everyone. Read the story here. B. Sc (Sand Mining) – since Egypt is in a desert and has plenty of sand, sand mining must a pretty popular course. Students graduating with a B.Sc. (Sand mining) can find plenty of jobs in Malaysia because we are also fond of sand mining especially if the licence is given to a crony company. And we mess up our rivers and beaches in the process of sand mining. B.Sc (Embalming) – Egypt has plenty of mummies and I guess their embalming technology must be rather advanced. So Malaysian students who come back home with a B.S. (Embalming) have no problems getting jobs at mortuaries and funeral houses. Good career choice. B.Sc (Pyramid marketing) – The Egyptians must surely know a lot about the get-rich-quick pyramid marketing. After all their fore fathers built the pyramids. Malaysians graduating with a B.Sc (Pyramid Marketting) can be assured of lucrative jobs in Malaysia because we also have many fly-by-nite, get-rich-quick-then-bankrupt-quicker schemes. B.Sc (Camel Husbandry) – Egypt has many camels – so I guess their universities surely must offer graduate courses in camel rearing, may be even at the PhD level. So I am thinking that many Malaysians are going to come home with PhDs in camel husbandry and all our political parties are waiting to recruit these Dr Untas. I am sure there are many other equally interesting subjects that are taught in Egyptian universities – that some of you may know of. Feel free to share. A double PhD in camel husbandry and cactus farming sound exciting. Anyone interested ? Planet of the Monyets will partially sponsor you. You forgot. Egypt is where the aedes mosquito and locusts come from. So, we’ll have experts in dengue fever treatment and locust related matters. Didn’t some of the ancient pharaohs died of malaria? Hey….good spot to study tropical disease, I tell you. Come on, don’t look down on other people’s country. purrrr….meow! B.Sc (Monkey Watching) – there’s plenty to watch in parliament. Malaysian tourists – not being “adopted children” of the gomen – got no help. Some may still be trapped there. The attitude is the same as that of the Indonesian and Bangladesh embassies here. This attitude to citizens reminds me of the dictator of Uzbekistan. When the Great Terrorist Empire wanted “al Qaeda” prisoners, he obliged by sending some of his own political opponents. Oh yes.. I forgot about the dreaded diseases and also the swarm of evil locusts that came on the Mummy movie. In ancient Egypt, they worshipped you. But if you go there now, they will probably eat you alive. LOL… but who is watching who ? I also read in the papers about the Malaysian tourist complaining that he got no help. Iguess they were focussing too much on the students and forgot all the other Malaysians. Embalming is a great major at Egypt University . Just look at 81 years old Mubarak ;so well preserved. May be the very least they can learn how to throw out our corrupted politician in Sarawak. Pyramid studies come in handy when they start to sell Amway to each other around Kampug. OTTAWA (CANADA) / LONDON (UK). 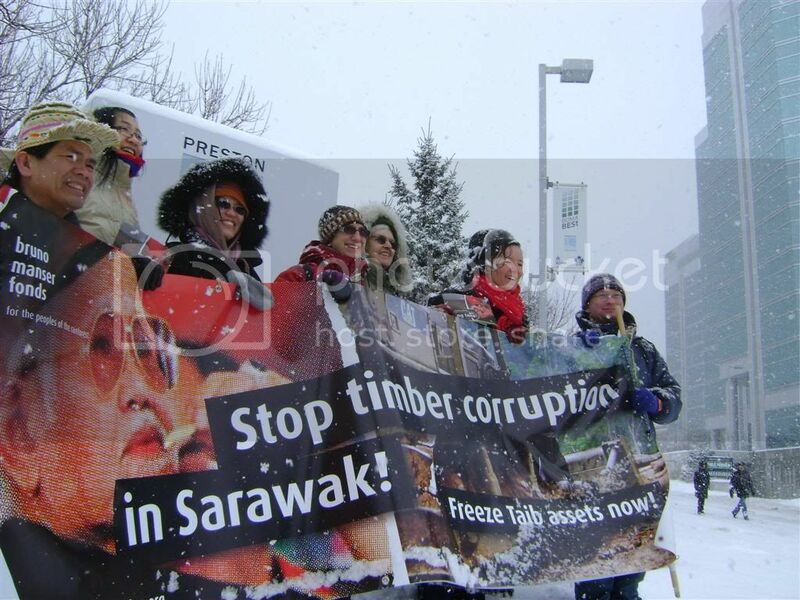 Human rights and environmental campaigners from Malaysia, Canada, the United Kingdom and Switzerland have today protested against corruption in front of property companies associated with the family of Abdul Taib Mahmud (“Taib”), the Chief Minister of the Malaysian state of Sarawak. 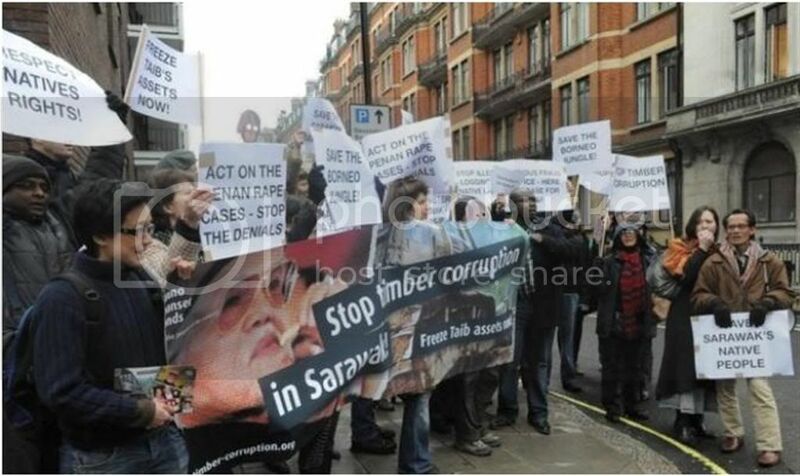 The protests took place in front of Sakto Corporation in Ottawa and Ridgeford Properties Ltd in central London. The Canadian and British governments are being asked to freeze the assets of nine Taib-associated companies in Canada and two companies in the UK which are estimated to be worth hundreds of millions of US dollars. Protesters in front of Jamilah Taib’s house at 688 Manor Avenue, Rockcliffe, Canada, the second most expensive private home in the Ottawa region. Jamilah is the daughter of the Sarawak Chief Minister, Abdul Taib Mahmud, and a major shareholder of Cahuya Mata Sarawak (CMS), the Malaysian state’s largest private company. CMS is being regularly awarded huge government construction contracts wihtout public tender. The company has also a 15-year contract for road maintenance of all of the state’s public roads. Protesters in front of the Adobe Tower at Sakto’s Preston Square development in Ottawa. Suite 910, 333 Preston Street is the administrative centre of Taib-linked property companies in the UK, Canada, Australia and the US. The company is being chaired by Jamilah Taib’s husband, Sean Murray, (Abdul Taib Mahmud’s son-in-law) who sits on the board of various Taib companies. Protestors at Preston Square, Ottawa, Canada, the headquarters of Sakto corporation. Sakto was founded in 1983 by Onn Mahmud, the brother of Sarawak Chief Minister Abdul Taib Mahmud. Onn Mahmud’s Malaysian company, Achi Jaya holdings, holds a monopoly over all timber exports from Sarawak. In 2007, Tokyo tax authorities found out that Onn Mahmud had set up a kickbacks scheme operating through Hong Kong. All Japanese shipping companies who wanted to export timber from Sarawak to Japan had to pay kickbacks to Onn Mahmud’s Hong Kong agent. Protestors in front of Ridgeford Properties Ltd at 10 Weymouth Street in central London. Ridgeford Properties is a wholly-owned subisiary of the Canadian Citygate International Ltd which is being directed by Jamilah Taib and her Canadian husband, Sean Murray. Protesters in front of Ridgeford Properties Ltd at 10 Weymouth St, London. In the centre, you can recognize “Papa Orang Utan” (Peter John Jaban), the DJ of Sarawak’s independent radio station, Radio Free Sarawak. The Canadian companies blacklisted by the Swiss Bruno Manser Fund as being associated with the Taib family are Adelaide Ottawa Corporation (Business number 2028546); City Gate International Corporation (446027-8); Glowell Development Corporation (1545868); Preston Building Holding Corporation (2108122), Sakto Development Corporation Pte. Ltd. (155207-4), Sakto Corporation (340439-1), Sakto Management Services Corporation (655948-4), Tower One Holding Corporation (2028542), Tower Two Holding Corporation (2018543). The British companies named on the Taib family assets blacklist are Ridgeford Properties Ltd (3268801) and Ridgeford Consulting Ltd (5572163). Ridgeford Properties Ltd is a wholly-owned subsidiary of the Canadian City Gate International Corporation. The Bruno Manser Fund also disclosed that it had lodged a detailed complaint with Jeanne M. Flemming, Director of Canada’s Financial Transactions and Reports Analysis Centre (FINTRAC), in June 2010 already. Hitherto, FINTRAC has left the complaint unanswered. Earlier this week, the Bruno Manser Fund criticized the Canadian authorities for their close business ties with Taib-family companies. No less than eleven Ontario Government Ministries are occupying offices at Sakto’s Preston Square Tower III in Ottawa. Abdul Taib Mahmud has been Chief Minister, Finance Minister and State Planning and Resources Minister of the Malaysian state of Sarawak since 1981. He has abused his political power in a spectacular way for personal gains and has managed to turn the resource-rich state of Sarawak on Borneo into his own private estate. Taib has been particularly criticized for the destructive logging of hundreds of thousands of hectares of tropical rainforest and for the marginalization of the state’s indigenous communities. Taib’s fortune is estimated to be worth several billion US dollars. The following companies are, or have been, closely linked to the family of Abdul Taib Mahmud (“Taib”), who has been Chief Minister of Sarawak, Malaysia, since 1981. Taib’s ill-gotten foreign and domestic assets are estimated to be worth hundreds of millions, if not billions, of US dollars. 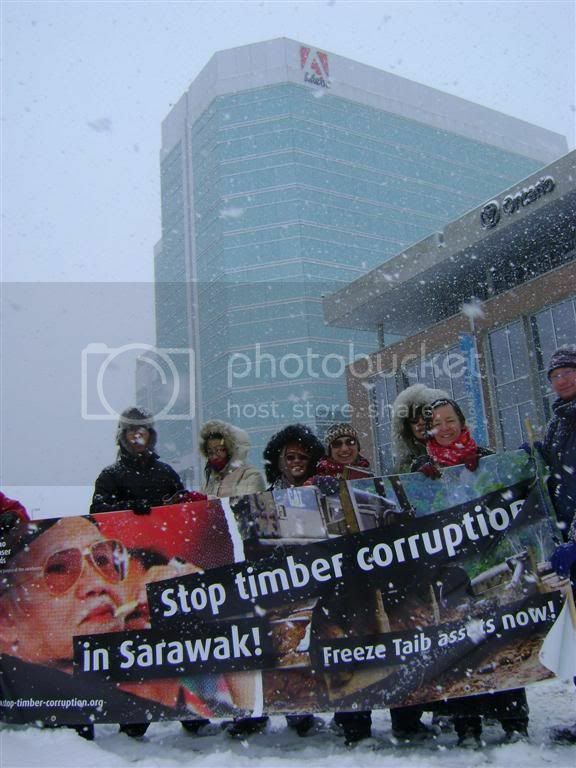 The Bruno Manser Fund and thousands of supporters around the globe are urging the authorities of the below-mentioned countries to investigate the financial transactions of the black-listed companies under their respective anti-corruption and anti-money-laundering legislations and to freeze all Taib family assets for later restitution to the people of Sarawak. USA: Sakti International Corporation Inc.; Wallysons Inc (the owner of the FBI building in Seattle! ); W.A. Boylston Inc; W.A.Everett Inc. This list has been established on 21 February 2011 and will be regularly updated. Surprising that the World considers Taib as a corrupted criminal but to the BN govt. he is a ‘honourable ‘ CM ! ! It must be a case of BIRDS OF THE SAME FEATHER [CORRUPT CRIMINALS ] FLOCK TOGETHER ? ? It is a shame that we , the Malaysians are quiet about the rampant misuse of power , by the BN thieves . Is it an idication that the Malaysians have no guts and expect others to fight our ‘battles ‘ ? SAD ! ! This is a welcomed development. 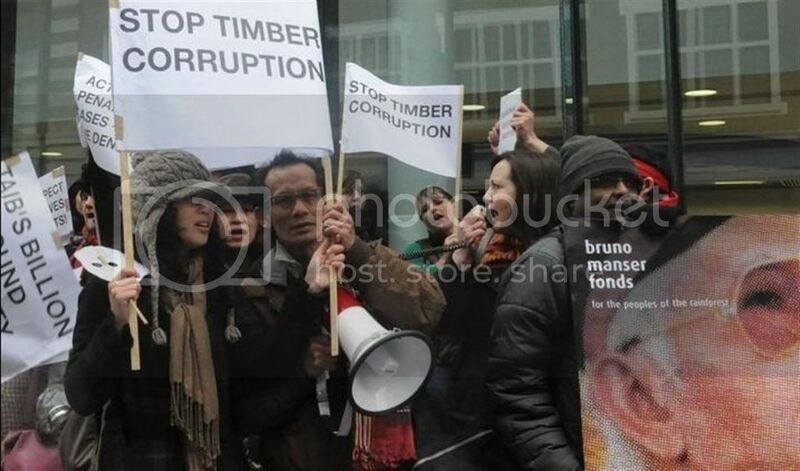 Wasn’t it last yaer, that a prestigous UK varsity honoured this corrupt timber baron? The natives of sarawak have been dispossessed and they have no voice in our country’s political sphere!! So, BMF, TQ for giving them a voice in the international arena!! Let’s hope this will give them some semblance of justice!! Malaysia’s wealthiest–Datuk Goh is the Richest!!! DatukGoh is worth than any one of them and more than the total combine of all of them and best of all- I am young and handsome!!! KUALA LUMPUR: The 40 wealthiest Malaysians are worth US$62.1bil (RM188.32bil), up by US$11.1bil (RM33.7bil) compared with last year, according to the latest rich list published by Forbes Asia. In a statement yesterday, Forbes Asia said the combined wealth was almost 22% more than the list in 2010. “The better coffers come on the back of the country’s healthy economy which grew 7.2% last year, the highest rate since 2000,” it said. The first two spots were still occupied by Tan Sri Robert Kuok Hock Nien and Tan Sri T. Ananda Krishnan, respectively. Kuok, 87, has held pole position since 2006 when Forbes Asia began ranking the 40 richest Malaysians. He was worth US$12.5bil (RM38bil), up by half a billion from last year. His biggest source of wealth was his stake in Wilmar International, the world’s largest listed palm oil company. Ananda, 72, was at No 2 with US$9.5bil (RM28.83bil), up from US$8.1bil (RM24.6bil) last year. His Maxis Communications Bhd is Malaysia’s biggest cellphone service provider. At No 3 is this year’s biggest gainer in dollar terms, Puan Sri Lee Kim Hua. The 81-year-old, widow of casino magnate Tan Sri Lim Goh Tong, was one of three women on the list this year. Her Genting shares took off when the company’s Singapore operations on Sentosa Island opened, boosting the family’s net worth by US$2.7bil (RM8.2bil) to US$6.6bil (RM20.03bil) from a year ago. Tan Sri Lee Shin Cheng, who built IOI Group into one of the world’s biggest palm oil producers, fell down a spot at No 4 with a net worth of $5bil (RM15.2bil), up by US$400mil (RM1.21bil) from last year. AirAsia Bhd’s Datuk Seri Tony Fernandes, budget airline pioneer and Forbes Asia’s 2010 Businessman of the Year, was ranked No 20 this year, down one spot from last year despite his wealth increasing to US$470mil (RM1.43bil) from US$330mil (RM1bil) last year. The only newcomer this year was Chia Song Kun at No 24 with US$400mil (RM1.21bil). The share price of his QL Resources Bhd, the seafood, egg production and palm oil company, has doubled since last year. Datuk Tony Tiah Thee Kian at No 35 was the only returnee to the list after a year’s absence as stocks in his TA Enterprise Bhd have recovered. He was worth US$170mil (RM516mil). Not all did well, however, as there were three this year who saw their wealth reduced, led by Tan Sri Vincent Tan at No 9. The self-made entrepreneur, who runs Berjaya Group, saw his wealth decline to US$1.25bil (RM3.8bil) from US$1.6bil (RM4.9bil) last year. Timber tycoon Tan Sri Tiong Hiew King was the only person who did not see any changes to his wealth. He was still worth US$1.2bil (RM3.64bil) and ranked No 10. Why Malysians are so freaking STUPID aks Bodoh!! Why invest in damn license plate….get the money and invest in Domains like I do..I own MalaysiaBodoh.com, BodohLand.com, BodohMalaysia.com and earn more money and only costs $7USD per year. Even chinese in China are investing in Domains now!!! KUALA LUMPUR: Malaysian motorists may be reluctant to pay their summonses but they will splurge a mind-boggling RM150mil every year for the number plate of their choice. Records from the Road Transport Department showed that the highest bid was RM300,100 – for the number plate MCA 1 two months ago. The same bidder, Asset Nusa Sdn Bhd, also spent RM101,000 to acquire MCA 2. The bid overtook the RM242,000 for TAY 1 last year. Prior to that, the record was held by a businessman who reportedly paid RM200,900 for TAN 1. The JPJ website has listed out the bidders and amounts paid for the MCA 1 to MCA 9999 plates for vehicles registered in Malacca. Among them were Noraini Abdul Ghapor, who spent more than RM19,000 on two numbers (RM14,444 for MCA 4 and RM4,888 for MCA 7777), and Tan Lay Kang, who forked out RM42,000 for three numbers (RM15,400 for MCA 8888, and RM13,300 each for MCA 3333 and MCA 9999). Another is MCA 1949, purchased by the MCA for RM2,200 to symbolise the year the party was founded. Duyong state assemblyman Gan Tian Loo from Malacca spent RM28,600 on MCA 5. But it isn’t just the auspicious numbers that get the people’s attention. A news report in 2004 noted that the plate TAH1 was bought for RM14,300 by someone who must have had a sense of humour. Also, someone posted on a web forum several years ago that the most beautiful number plate he had seen was BBB 888 as it was designed like a piece of art. Former Penang DAP strongman Gooi Hock Seng went around with MR 6001 to reflect his surname. Some motorists are willing to hold off the purchase of their vehicles until they get the right number plate. Another motorist, M. Phylis Mann, said she paid RM200 for the number 1798, which she said signified long-term prosperity. In the past, JPJ had also released special licence plates for major events such as the 1998 Commonwealth Games and meetings of Asean and the Organisation of Islamic Conference. “I will not be surprised if we get huge bids for plates starting with WWW – the acronym for the World Wide Web,” Transport Minister Datuk Seri Kong Cho Ha said. Another possible popular choice would be the Selangor plate carrying the letters BMW. The JPJ has earned significant revenue from tenders of special numbers, which is its third highest source of revenue after the renewal of road tax and driving licences. Currently there are 21,250,145 registered vehicles on the road. SITEMAP IS GOOD FOR SEO?